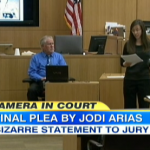 Yesterday, as the death penalty phase of the Jodi Arias trial continued, the convicted murderer made a statement to the jury, asking for a life sentence. Today, on Good Morning America, Dan discusses yesterday’s plea, as well as another TV interview, alongside HLN legal analyst Nancy Grace. Nancy believed that she should have turned to Travis Alexander’s family and apologized, but Dan says, “I think no matter what she said, because of the case that’s been built up against her, any apology at this point is going to seem hollow.” They also discussed the t-shirts she designed and presented, which she plans on selling to support other victims of domestic violence: “This was the biggest mistake in my view that I think that she made, which was, she said, ‘Oh I’m going to be selling these t-shirts with the word Survivor on them, as a domestic violence survivor, and you have to ask yourself after the jury has already rejected that notion, why she would bring that up in the statement was the biggest mistake.” Watch the full segment for all their disagreements here.